Millennials will make up 75% of the global workforce by 2025 and 91% of them say they aspire to be leaders. It’s clear, however, that leadership can mean very different things to different people; in fact, an internet search brings up at least twenty-five different leadership styles! To get to the bottom of what sort of leadership styles are most suited to your personality or type of work you do, we’ve created “The Ultimate Handbook on Leadership Styles”. Leaders can be found anywhere in life – in politics, philanthropy, the arts, science and sports to name a few – but for this guide, we’ll focus on leadership styles particularly in business management. Introduction: What is a leadership style? Wikipedia tells us that a leadership style “is a leader’s method of providing direction, implementing plans, and motivating people”. Everyone has an opinion on what makes a good leader or a bad leader, but it is generally accepted that a person who is unable to successfully produce those three outcomes “providing direction, implementing plans and motivating people” are lacking leadership. What is not generally accepted is what method works best, this explains why there are so many styles out there. This Handbook will attempt to show you every possible style that exists so you can get the facts and anecdotes to make your own decisions about what approach you want to pursue. How many types of leadership styles exist? As we mentioned there are many, many styles of leadership, any or all may be useful to your organization. We’ll go into some of the most well-known. What is the best leadership style and why? 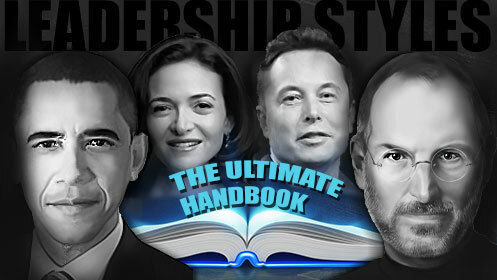 We’ll explore twenty-five leadership styles in this handy guide. The jury is certainly out on which one is the “best”, however it’s safe to say that a complete lack of leadership – which we’ll explain in detail – can certainly be considered the “worst”. What leadership style has been least successful? Of the over twenty leadership styles we looked at, the one most seen as detrimental to the success of organizations has been passive leadership, or in other words a lack of leadership. “Servant leadership” is a leadership philosophy in which the main goal of the leader is to serve the people in an organization rather than the organization or company itself. That means he or she is accountable to each and every employee, not just the ones on top. With companies attempting to retain millennials who demand such accountability this type of leadership is becoming more and more sought out. Closely linked to servant leadership due to its egalitarian focus, with “transformational leadership” a leader focusses on inspiring and nurturing individuals on their teams to become leaders themselves. Diversity thought leader Rayona Sharpnack of the Institute for Gender Partnership gives a great example of what a transformational leader looks like in a recent interview: “Leadership is not necessarily a function of position, authority or title! Even an entry-level employee can be a great leader. Leadership is determined by ‘followership.’” In a recent survey, transformational leadership beat out all other leadership types in popularity with 63% of millennials saying they aspire to be this type of leader; organizations hoping to attract and retain their workforce should take note that millennials see this as the most effective leadership style. How is empowerment changing the leadership style? Our grandparents saw leadership very differently than we do. The idea of a business leader often meant someone in the corner office, a person who was in charge and therefore held final authority in all decision making. Millennials are changing all that with 63% of them saying they aspire to be a leader in the next five years. If you do the math that’s a lot of bosses. Traditional leadership needs to rethink how workplace teams are built, managed and led if they want to recruit and retain a millennial workforce. If servant and transformational leadership are examples of modern and progressive modes of leadership, then “transactional leadership” is a good illustration of what a much older, more traditional style of leadership entails. Exactly like it sounds, leaders who implement this style respond to followers with a response which can be either a reward for doing what they’re told or punishment for noncompliance. Who is more effective, a Positive Leader or a Negative Leader? When a transactional leader uses negativity or punishes noncompliance, employees may scramble to get their tasks done, but under the surface, they neither respect their boss nor enjoy their work. A recent study showed that “workplace incivility costs employees $14,000 per company due to lost productivity and work time”. Positive leadership, whether it is transactional or some other style, is more effective for company morale and the bottom line. Author and Innovation adviser Greg Satell gives us a very concise definition of what a good leader is not: “An ineffective leader sees followers as subordinates who are, more than anything else, means to an end.” Leaders who make all their own decisions, ignoring input from those they see as subordinates are autocratic or authoritarian leaders. Studies are starting to show that this sort of management is not financially the most profitable, however it is certainly still a common style in organizations. Charismatic leadership is autocratic leadership with a twist. Leaders who utilize this style ultimately do not see their subordinates as part of the decision-making process, however by the same token such leaders are compelled to want their followers to be content with their subordination. It is not transactional leadership per se, where a follower is rewarded with compliance – but instead the leader’s personality and approval is both the inspiration and reward. This type of leadership was famously analyzed and explained by German sociologist Max Weber in the late 19th century. Ask two business analysts what the definition of “Strategic leadership” is and it’s likely you will get two fairly different definitions. We’ll defer to the experts at Harvard Business Review who give us six skills that, in combination, are a must for strategic leadership: “the abilities to anticipate, challenge, interpret, decide, align, and learn.” A manager who has those abilities should be able to motivate others and enhance the prospects of success. While all leadership should, of course, be at its base ethical, ethical leadership is a style that uniquely mixes aspects of charismatic, democratic and transformational leadership. Ethical leaders “lead by example” and have a strong moral base on which they make all decisions. Benevolent leadership takes ethical leadership a step further; instead of simply basing decisions on a moral code, benevolent leaders attempt to create “greater possibilities for themselves, their communities, and the world at large” explains sustainability organization Benevolent Capitalism. What are some benevolent leadership styles? “Benevolent leaders” tend to use methods that combine servant and transformational leadership, however pretty much any sort of leadership style could fit here – from authentic to creative or directive. The only type of leadership style that is impossible to incorporate with benevolent would be passive leadership in which the individual leader does not consider “communities” or “the world at large” but is only concerned about him or herself. The word “paternal” means father, so paternalistic leadership is a sort of leadership which is inherently hierarchical; a paternalistic boss expects loyalty and obedience. On the flip side, the rewards from this sort of leader can create a “big happy family” which can be both nurturing and comforting to individuals. Directive leadership is simply a type of leadership style which is very instructive; this sort of leader gives detailed instructions to subordinates on how to perform all their expected tasks. Some call directive leaders “micro-managers” and this style has become less and less popular. Passive leaders basically don’t do anything then show up when there’s a problem. Needless to say, this sort of leadership is largely ineffective. What are the characteristics of a passive leadership style? If you take the opposites of all of the positive qualities of good leaders such as accountability, transparency, fairness and flexibility – there you have passive leadership. These leaders tend to: build walls, blame others, have difficulty communicating and make strategies with nothing to back them up. Why do these people become leaders? Reasons may vary – they could have started out as good leaders but gone down the wrong path, or perhaps they were hired and did not prove to be who they pretended to be. Regardless of what the reasons are, sometimes employees are basically stuck with passive leaders and must jump in to become leaders themselves to stave off potential disaster. What does the term “Toxic Leadership” mean? Toxic leaders have the above characteristics of a passive leadership style; typically these leaders create unhappy employees who at best give poor performance and at worst cause outright sabotage to their companies according to a new study from Harvard Business School. More a title than a style of leadership, executive leaders are senior managers who “typically oversee such business activities as fulfilling organizational goals, strategic planning development and overall decision making”. This type of leadership is not a specific style per se, however thought leaders from Lolly Daskall to Bill Hybels have written multiple articles about this topic so it is important to consider. Most of the aspects of progressive styles such as transformational and democratic leadership are also shared by courageous leaders including accountability, transparency and fairness. Sounding a little like autocratic leadership but perhaps not quite as harsh, bureaucratic leaders are stereotypically ‘by the book’ with “fixed official duties” under a “hierarchy of authority”. Study.com tells us it’s one of the most prevalent forms of management around today. Wikipedia tells us that people-oriented leaders “are focused on supporting, motivating and developing the people on their teams…. (and) encourages good teamwork and collaboration, through fostering positive relationships and good communication.” This shares an aspect of democratic and servant leadership, but there is a very specific formula applied to get from A to B.
Task-oriented leadership is grouped in with people-oriented leadership because while relations-oriented leadership is focused on satisfying and motivating team members, task-oriented leaders worry less about employees and more about the tasks at hand. With some similarities to “directive leadership” task-oriented leadership is said to be good for employees who don’t have good time management skills. A new and relatively unknown style, “coaching leadership style” is the opposite of an autocratic leadership style and most like a democratic style where a leader sees themselves not just as a boss but as a coach, working to get the best out of his or her team. This style not only has benefits for the company “coach leaders” work for but can also help develop new qualities and competencies in employees. What are some academic theories of flawed or bad leadership? Most research done in Universities tends to focus on constructive leadership behaviors. Up until recent times, many toxic leaders were able to fly under the radar as long as they were performing up to par. However, the #metoo movement and the high costs of both workplace incivility and employee turnover are bringing a new spotlight on what leadership is and how leaders should behave. New studies from Norway and the UK have shown that a wholesale lack of leadership, as in passive or laissez-faire leadership, can lead to bullying and psychological stress for the employees who report to such leaders. How can one switch a leadership style to manage diversity? Diversity is not a new challenge per se, many of our workplaces have been diverse for years. The challenge organizations face now is inclusion – giving individuals who have been overlooked due to cultural or other biases – a seat at the table and equal treatment. We know that a lack of diversity of people leads to a lack of diversity of opinions which is now more than ever financially a mistake as “companies in the top quartile for racial/ethnic and gender diversity are 35% and 15% more likely to have financial returns above their national industry medians.” Common sense would tell us that an autocratic or transactional leadership style is probably not the best for driving inclusion; a leadership style that puts employees first such as authentic, creative, transformational or coaching– or a combination of all four – would be best suited. Which style of a leader can be good or bad? It is clear that passive leaders who bully or resort to other unprofessional tactics to get what they want have no place in the modern workforce. However, the question of what a “good” leader is becomes much harder to pinpoint. An organization needs to identify its goals and values and seek out leaders accordingly. What leadership style must the CEO have to be successful? Phil Johnson, Founder of Master of Business Leadership™, has said that “The primary role of an executive is to create a safe environment for the people that report to them to take risks”. Perhaps the most relevant style to create such an environment would be creative leadership which requires flexibility, adaptability and an ability to get rid of ego, step back and let followers lead. The easy answer to that question is, of course, however dramatic or sudden change is never a good idea. Employees expect consistency from their leaders, so flipping leadership styles mid-quarter is inevitably going to backfire. Transparency and communication are key in any sort of work relationship, leaders need to keep their employees in the loop. Explaining that any change has been brought about due to employee input will ultimately increase employee trust and ultimately loyalty. Having trouble keeping all of the different types of leadership styles straight? You’re not the only one. Check out LeadersIn for in-depth articles and video from Simon Sinek to Beth Comstock, Eric Ries and more. We have the content you need to help you understand the different types of leadership that are affecting the business environments today and will be defining the most successful companies of tomorrow.